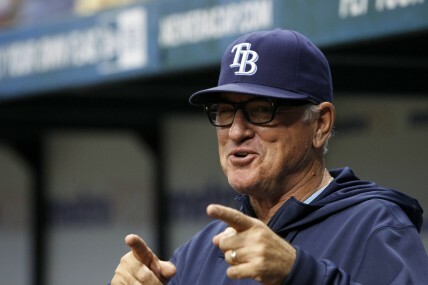 When the news first broke last Friday afternoon that Joe Maddon opted out of his contract and was no longer manager of the Tampa Bay Rays, I was hopeful. Hopeful it could mean a change for the Cardinals, as I tweeted at the time. Not that I really believed John Mozeliak would make a change and remove Mike Matheny as manager, but I could dream. He has personality galore, but he also has an understanding of Cardinal Nation. He did, after all, grow up as a Cardinals fan. He’s done wonders with a bare-bones budget in Tampa Bay. He works well in bringing up young players. But he also has enough “old-school” in his blood to satisfy the traditionalist. During my lunch on Friday, I was listening to sports radio station the Score in Chicago. It wasn’t a surprise they were predicting Maddon would be coming to the Cubs — not a surprise because what team wouldn’t want Maddon? Now it appears that Friday prediction of Maddon to the Cubs will be a reality. Jon Heyman of CBS Sports had the news yesterday, as did Mark Gonzalez of the Chicago Tribune. I knew the Cubs would be getting their “real” manager sometime in the next year or two, meaning the manager who would be the final piece of their rebuilding process Theo Epstein began when he became Cubs president in 2011. And I figured that real manager would be a big name — but I was thinking, given his history with Theo, it would be Terry Francona. And that would have been fine. After 2004, I don’t really like either one. They’d be perfect together in Chicago. Sure, it absolutely makes sense. Maddon would be logical to manager just about any team, but he definitely fits for a team like the Cubs that — as Tara wrote three years ago — has young players, since that’s what their whole rebuilding process the past couple years has been about, plus enough of that old-school blood too. More importantly, though, is the PR value and buzz he’s already creating before the move is even official, as was evident in listening to the Score on my drive home yesterday afternoon after Heyman’s story was published. The usually purposely curmudgeonly hosts were both positively giddy as they interviewed Heyman. And, I have to reluctantly admit, that buzz makes sense too. Interest in the Cubs among even the team’s most die-hard fans has been waning in the past couple years, with attendance at Wrigley Field dropping as a result. The glimpse of such prospects as Arismendy Alcantara, Javier Baez and Jorge Soler later in this season brought some of those disinterested fans back to paying attention. And, of course, there’s still the promise of Kris Bryant’s debut to come. So now, who better than a big-name manager with a track record of success to really bring back the interest — and the corresponding ticket sales — than Joe Maddon? I saw the reaction firsthand late yesterday as my Cubs fan boss gushed about the news and had to immediately text his son to let him know. There are some Cards fans who want the Cubs to succeed again for the interest a real rivalry creates, while others (hi, Michael!) believe an ideal season would be the Cubs going 0-162. My own feelings are more toward the latter, although seasons like 2012 and 2013 when their win total is in the 60s is OK.
That’s not going to keep happening, though — they did improve to 73-89 this season, which wasn’t too far behind the Reds’ finish of 76-86. So first it was the Pirates improving into a contender, with a manager I really like in Clint Hurdle, and now the Cubs are poised to do the same — with a manager I really like. Meanwhile, my feelings for Mike Matheny remain mostly unchanged. I’d still take Joe Maddon over him right now. Unfortunately, that’s not going to happen. Hey, Joe, please say it ain’t so. This entry was posted in General Baseball and tagged Chicago Cubs, Joe Maddon, Mike Matheny by Christine Coleman. Bookmark the permalink. Hey now! I am assuming I am not the Michael being referenced here, because if the Cubs went 0-162 that means the Brewers and Reds win at least 17 games, and nobody wants to see. Very nice article, let’s all hope it doesn’t come to fruition.